If you’ve been following Thielemann’s Bruckner cycle with the Staatskapelle Dresden, you’ll know what to expect from this Third Symphony. It’s a classic Thielemann account, with long, sinuous lines; a warm, well-grounded orchestral sound; and a sense of scale and grandeur that is all too rare among recent accounts. Thielemann is well known as a Bruckner specialist, but this is his first commercial recording of the Third Symphony: This DVD/Blu-ray cycle has so far covered Symphonies 4, 5, 6, 8, and 9, and his other recordings, with this orchestra and the Munich Philharmonic, include Nos. 4, 7, and 8. It will be interesting to see what he does with the earlier symphonies, because this Third Symphony is presented in the spirit of the later works, just as grand and imposing, with no sense of reducing the scale of the performance for the (slightly) lesser scope of the work’s conception. The opening is wonderfully atmospheric, with the sumptuous strings supporting an equally warm and broad solo trumpet. The string tone sometimes tends toward the nebulous, especially in surround sound, but Thielemann knows when to impose greater agogic emphasis to maintain the focus of the musical argument. His first movement tempos are slow, especially at the opening of the development, and while this is usually to create a placid starting point for greater drama ahead, the increase in tension is only accompanied by modest tempo increases. Those slow tempos speak of a daring approach, and dynamics too often go to extremes. The very quiet opening of the second movement brings an appealing sense of fragility to the Dresden sound, still as characterful and complex as ever, but reedy in the woodwinds and transparent in the strings. The sheer unity of the woodwind playing is impressive throughout this performance (performances, rather, the video is edited from two concerts), especially so in the quiet dynamics early in the second movement. The Scherzo is taken relatively fast, with the rich orchestral tone here trading against nimble rhythmic figurations, Thielemann always finding a satisfying balance between the two. The Finale can sound poorly structured in lesser hands, but Thielemann finds logical tempo choices at every turn. The rising string 16th-note figure at the opening is fast and sleek at every appearance, appearing out of nowhere after each interlude to revive the momentum. And the conclusion is suitably triumphant, the horns and trombones adding a bronzed sheen to the major-key dénouement—buoyant but without frivolity. Earlier installments in this series were recorded at the Semperoper Dresden, in its concert hall guise, but this one is from the Philharmonie in Munich. The modern decor there is not as grand as the Rococo interior of the orchestra’s home, and the sound is considerably less resonant. Nevertheless, the recorded sound is clear and detailed, and atmospheric in surround, which serves the brass and timpani better than the stereo mix. The video work is busy, and six cameramen are credited. Lots of close-ups, then, of the players and of the ever-stentorian Thielemann, who conducts from memory. There are a few arty zoom and cross-fade effects, but they are kept to a minimum, and the camerawork is never distracting. 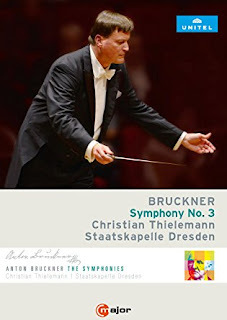 Another success, then, for Thielemann and his well-honed orchestra, demonstrating that their mastery of Bruckner’s music applies as much to the earlier symphonies as the late. Fans of the conductor won’t be disappointed.